Mike Ciannilli with his long-time charge, the orbiter Columbia (Credits: Mike Ciannilli). On February 1, 2003, Mike Ciannilli was a contractor for NASA. He worked as a test project engineer, responsible for the engineering systems coming together in the firing room. He was assigned to Space Shuttle Columbia, which seemed fitting somehow. Ciannilli had a long love affair with Columbia, dating from his middle school days, when he made a replica of the ship for his school science fair. At the time of the ill-fated STS-107 mission, he was monitoring issues during processing flow in the turnaround between landing and launch and he manned the launch countdown. When he talks about listening to your vehicle, it’s clear he still hears the rumbles and creaks of Columbia, a decade after she disintegrated before his and everyone’s eyes. 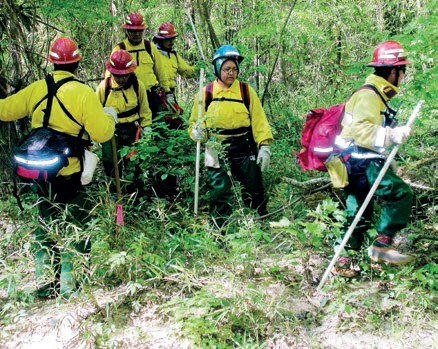 Members of a US Forest Service team walk a Columbia recovery search grid (Credits: NASA). After several weeks, Ciannilli became the Air Operations lead: “I was helping organize the flights at that point and trying to coordinate the scheduling.” They did not finish the search until May 2003, nearly four months after the accident. By the time he got back to Cape Canaveral, the Columbia Accident Investigation Board was well on its way to producing what is now known as the CAIB Report. It is still one of the defining accident reports of modern spaceflight, what Ciannilli describes as “an awesome tool,” one he recommends everyone, especially anyone involved in spaceflight, read and reread. – In the video below, a feature about the search and recovery of Columbia debris. 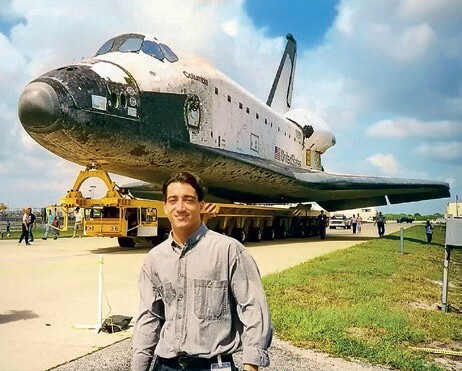 While Ciannilli, his colleagues, and volunteers were out hunting for pieces, a reconstruction team was hard at work at the shuttle landing facility, trying to figure out where those pieces fit. “They were reconstructing Columbia as best they could and they did a really amazing job of putting her back together,” says Ciannilli. 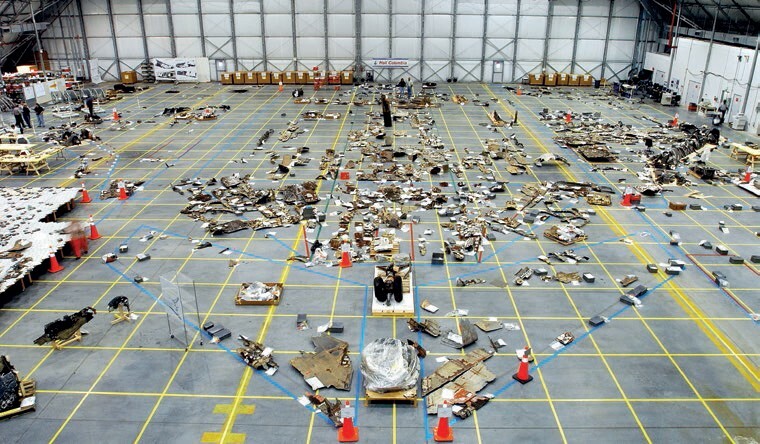 When the CAIB Report was delivered to US President Bush in August 2003, the remains of Columbia were turned over to NASA, who moved them from the shuttle hangar to the Vehicle Assembly Building. 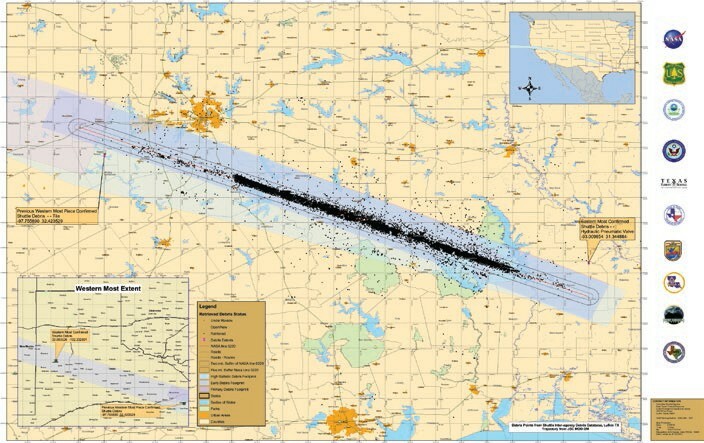 The debris field in East Texas spread over 5,179 sq. km. The search covered 700,000 acres (Source: CAIB Report, p 45). The discussion turns to the lessons learned from Columbia, and for a moment Ciannilli seems not to know where to start. “There’s a bunch,” he says, and proceeds to list some of the big ones: keep your models and tools up to date, understand your materials, guard against the off-nominal becoming normal, continually question and revalidate your design, and of course, institute a culture of open communication. But one thing that Ciannilli comes back to again and again is listening to your vehicle. 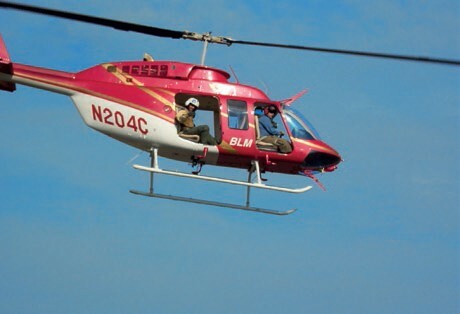 Mike Ciannilli in back of a helicopter during Columbia aerial search operations in Texas (Credits: Mike Ciannilli). “People say that the vehicles become alive. They become personalities,” explains Ciannilli. “I can tell you how Atlantis behaves and how Columbia starts up in the morning.” These quirks, much like those you might be familiar with from your family automobile, can provide important clues to changes in spacecraft behavior – clues that may not be present in more formal types of data. “The vehicle’s talking to you, the hardware’s talking to you – listen to it,” urges Ciannilli. “Things are happening and they often start as very small things. Understand what’s happening.” He specifically notes the issues shuttle managers faced relating to tile incidents. “Even the last few years, we didn’t really understand carbon-carbon, its strengths and its weaknesses.” Accepting tile incidents as normal without understanding the source of the incidents was a clear pre-Columbia failure. Ciannilli gets animated when he describes what the shuttle program could have been like had the Columbia accident never occurred. “Our plan was to fly space shuttle to 2020 or 2025 even,” he says, describing the extension program and the upgrades to cockpit, engines, instrumentation, computers, GPS, and “a whole host of systems,” that were already underway at the beginning of 2003. Even after the accident, technically the shuttles were in excellent condition, possibly the best they’d ever been. “The incidents between flows were being significantly reduced, the crews were reporting on orbit the vehicles were performing better and better every flight,” Ciannilli recalls. But political winds blew NASA down a different path. Recovery volunteers camp in a warehouse in Texas after a day of searching for debris (Credits: NASA). Ciannilli observed clear changes in NASA’s communication culture following release of the CAIB report. “After the accident it definitely improved a lot and I think it got better as time went on after the accident – more improvements were put in place and the culture was established,” he recounts. But, he says, that fear of standing up to say something is wrong will never go away entirely. Reconstruction of Columbia debris in the hangar at Kennedy Space Center (Credits: NASA). Ciannilli is also clearly excited about the new research that results from studying Columbia’s remains. “It’s definitely pushing the bounds of knowledge for the upper atmosphere and the effects there.” While researchers commonly publish their findings, there is no formal mechanism to incorporate new materials and structural knowledge back into the next generation of space vehicles. “It’s a treasure trove for the folks that do want to learn about it,” says Ciannilli. This article was originally published in Space Safety Magazine Issue 6, Winter 2013, on the occasion of the tenth anniversary of the Columbia disaster.